John Singer Sargent’s engagement as an official war artist during the First World War is an involved and protracted story. It led to the creation of his masterpiece Gassed, a highlight of the Frist Art Museum’s exhibition World War I and American Art, and to a sequence of remarkable watercolors painted near the front line. It was followed by General Officers of World War I, a group portrait of British and Commonwealth commanders. 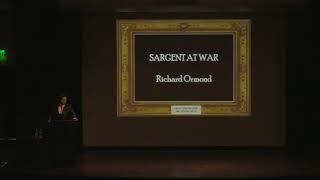 In this lecture, Richard Ormond places these works in the context of Sargent’s career by analyzing the artist’s response to the horrors of war, tracing the sources of his inspiration, and charting the stages of his artistic process. Richard Ormond, Commander of the British Empire, is a former deputy director of London’s National Portrait Gallery and former director of the National Maritime Museum in Greenwich, England. A great-nephew of John Singer Sargent, Ormond is currently director of the Sargent catalogue raisonné project, as well as co-author of the nine-volume Sargent survey published by Yale University Press. Ormond has curated many Sargent exhibitions, including the Met’s Sargent: Portraits of Artists and Friends (2015). His books on nineteenth-century British art include studies of Edwin Landseer, Frederic Leighton, George Frederic Watts, and Franz Xaver Winterhalter, among others. This lecture was supported in part by the Department of History of Art at Vanderbilt University.